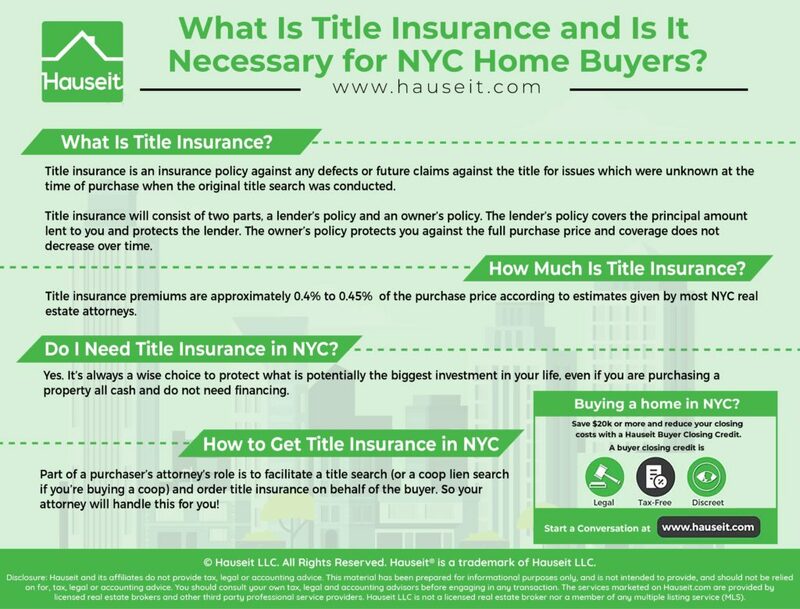 What is title insurance? How much is title insurance? Do I need title insurance? Who picks the title insurance company in NYC real estate transactions? Should I be worried if my lawyer owns or is getting paid by the title insurer? How much are title insurance premiums in New York City? 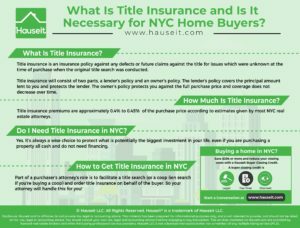 Do I Need Title Insurance in NYC? Title insurance is an insurance policy against any defects or future claims against the title for issues which were unknown at the time of purchase when the original title search was conducted. This means you’ll be protected if a previous owner comes out of the woodwork ten years after your purchase, and claims that there was a mistake in the chain of title and that he never sold the property to the seller of your property, which means the seller of your property didn’t have a right to sell it to you. Title insurance will protect you and your mortgage broker or bank from threats like this. Your legal fees will be covered and in the case of loss, your principal will be fully covered. Title insurance will also protect you from unpaid property taxes or other liens that your title search failed to identify at the time of purchase. Title insurance along with a title search will be required by your lender if you are purchasing real property with a mortgage. Since co-op apartments are not considered real property, you will not be required to purchase title insurance when buying a coop in NYC. However, your lawyer may still conduct a coop lien search on your behalf. Title insurance will consist of two parts, a lender’s policy and an owner’s policy. The lender’s policy covers the principal amount lent to you and protects the lender. The policy coverage amount will decrease as you pay down the mortgage. The owner’s policy protects you against the full purchase price and coverage does not decrease over time. Title insurance is one of the largest closing costs for buyers in NYC. Title insurance premiums are approximately 0.4% to 0.45% of the purchase price according to estimates given by most NYC real estate attorneys. The exact amount will vary by the title insurer and the specific deal, but there will be a fixed fee component plus a variable fee component that adjusts with the purchase price. The variable component is more significant, hence most real estate lawyers are comfortable giving an estimate of 0.4% to 0.45% of the purchase price for title insurance. It’s important to understand that title insurance is paid one time by the purchaser at closing. There are no monthly, continuing premium payments as you might expect from health insurance plans. However, if you sell the property, the new buyer will have to pay for title insurance again. If you need to refinance your mortgage, you’ll need to pay title insurance again, though the cost will be less for a refinancing. Title insurance will typically be the third biggest closing cost for buyers of normal re-sale property in NYC. The biggest closing costs that buyers of property in NYC will face are the Mortgage Recording Tax and the Mansion Tax. If they are buying a new construction condo or townhouse, the sponsor will ask the buyer to pay the seller’s transfer taxes. In the case of new development purchases, title insurance will rank fourth in terms of biggest closing costs for buyers in NYC. Yes. 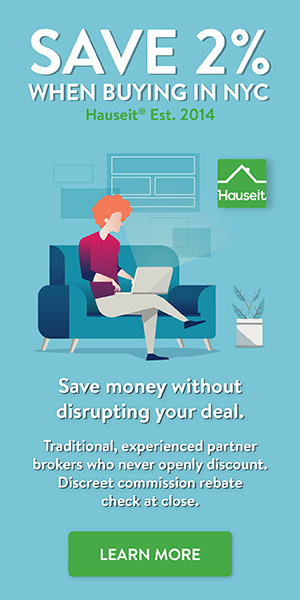 It’s always a wise choice to protect what is potentially the biggest investment in your life, even if you are purchasing a property all cash and do not need financing. If you are an all cash buyer, then yes title insurance is a decision that you can make. However, why would you gamble on knowing for certain that there are no errors in the chain of title for a property you are seeing for the first time? How do you know that the property wasn’t mistakenly sold without an owner’s consent throughout its long history? What if a property was sold without the consent of all heirs to a property in an estate sale? What if a missing heir pops up after a property has already been sold? What if the property was sold as a result of deed fraud? Meaning that the deed was fraudulently changed without the real owner’s knowledge, and then sold? There’s no reason that you should take this kind of risk, especially if you intend to hold on to the property for many years because the cost of insurance is only paid one time and upfront. If you are buying property with a mortgage, then you will need title insurance because your mortgage lender will require it. You simply won’t be able to get a mortgage if you refuse to pay for title insurance! In New York City, purchasers and sellers each have their own lawyer who guides them through contract review, legal and financial due diligence and the closing process. Part of a purchaser’s attorney’s role is to also facilitate a title search (or a coop lien search if you’re buying a coop) and order title insurance on behalf of the buyer. As a result, it is the buyer’s attorney who typically picks the title insurance company as buyers usually will already be overwhelmed by the NYC closing process and will have little to say on the subject. You’ll want to make sure that there are no conflicts of interest between the title company and your lawyer. This can be an issue if the lawyer has an interest in a title company, or is being compensated for referring clients to a title company. This is just one of the questions you should ask your real estate attorney before hiring them. Even though the buyer’s attorney typically picks the title insurance company, the buyer can always request that the lawyer pick a specific company if the buyer has a preference. The buyer may want to do this if he or she suspects that the lawyer has ulterior motives by choosing to work with an unknown, small title company that may be related to the lawyer in some way. What is a NY Disclosure Form?